I love how easy it is to warp the Mirrix looms. I’ve found that there are a few things that can make the process of attaching the heddles go quick as a wink. 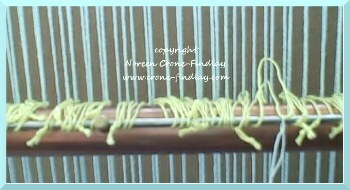 The first thing that I do, after I release the warping bar from the blocks and turn them around, is to slide a piece of cardboard or masonite between the layers of warp strands at the front of the loom and the back of the loom. 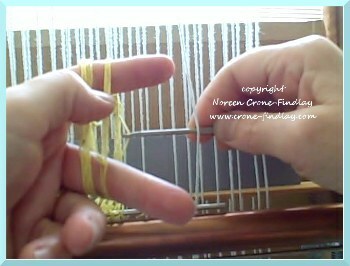 Then, I use a shed stick that is at least as long as the width of the loom to pick up every other warp strand. Then, I flip the shed stick on it’s side, with each end being supported by the shedding device blocks. I now have 2 layers of warp strands because of this shed being open. So, to keep the back warp strands out of view, I slide a ruler or strip of cardboard into the open shed. Bliss! Now, I just have one set of warp strands ready for the heddles- Yay! This makes things sooooo much easier! I like the center brass knob of the shed changer to be as close to the exact center of the warp strands. So, I count how many strands I need to attach to the rod, and divide that in 1/2. I place 1/2 the heddles on 2 of my fingers, and 1/2 on the other 2 fingers. 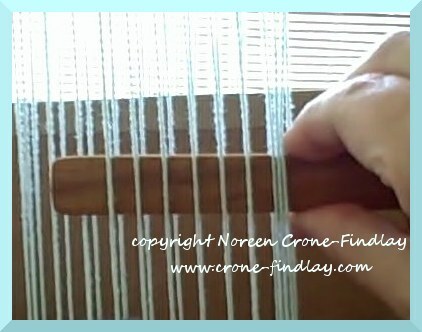 I loosen the heddle rod and slide it along so it’s about 2 inches/5 cm from the edge of the warp strands. 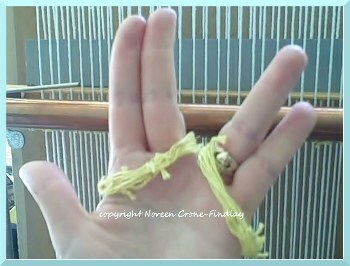 Then, I reach behind the warp strand with a crochet hook, pluck a heddle off my fingers, and pull it behind the warp strand. I catch both ends of the heddle loop and pop them onto the heddle bar. Slide the bar along as you go. When I run out of the the first clump of heddles, I should be half way along the warp strands. I work across , picking up all the strands, and attaching them to the heddle bar, then tighten up the little nut that holds the heddle bar in place. Remove the shed stick and ruler, then rotate the heddle bar, sliding the heddles down the warp strands. Turn the shed opener enough so the heddles open your first shed. 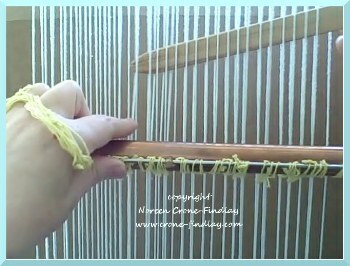 Use the shed stick to pick up the warp strands that are between the warp strands that you have just heddled. Turn it on it’s side, insert the ruler, and repeat the process. 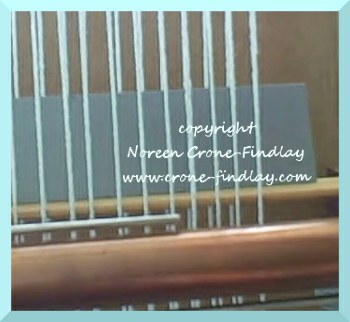 Check to make sure that all the heddles are securely attached to the heddle rods. When I was making the video, one little bounder escaped, which was actually a good thing. This allowed me to show how to capture the escapee heddle and tie it back in place. Remove the shed stick and ruler and check the sheds, then attach the handle or treadle and Voila! Maybe not. Your audience is more than likely heavier into textiles, but I just can’t help but take advantage of great directions! Thanks.